This is precisely the restriction that Microsoft has put in place to prevent unnecessary Home Realm Discovery prompts, but we are unexpectedly seeing it when adding an alias. After a bit of testing, it appears that the restriction is scoped at the Azure AD Registered Domain Name. Organisations may register domain names with Azure AD either to prove ownership of a domain name for account creation, or for e-mail addresses/aliases. 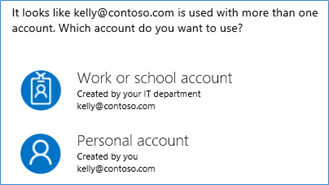 In my case (and my colleague’s), we added aliases to our Microsoft Accounts from registered domain names before Microsoft put this registered domain name restriction in place and we were trying to make these e-mail aliases our new primary Microsoft Account username after the restriction was introduced. The secondary issue here is that we hadn’t expected this restriction to take effect if the new alias didn’t in fact exist as an Azure AD username. 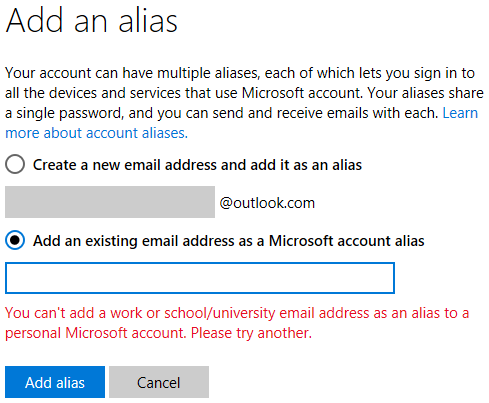 So… this all kind of makes sense once we put the pieces together, although it would be good if the Microsoft Account Manage How You Sign In to Microsoft page offered an explanation of why the alias cannot be made primary. This probably seems like the obscurest of issues, but I suspect many people will encounter it, since Microsoft are encouraging us to make a non-conflicting alias primary. The ultimate solution to this problem will require creation of a new alias in a namespace that hasn’t been registered with Azure AD. Over the last couple of years we’ve started doing less AD FS work, with the advent of Password Hash Sync for Azure AD sign-on, and Microsoft’s continued investment in Azure AD Premium. We’ve also seen a few organisations struggle to operate AD FS successfully, even if I personally like the technology. So I’ve changed our approach to unveil all of this with as much realism as possible, and to draw some feature comparisons in both directions. We also spend a lot of time talking about expectations of SSO, and how the ways we think about SSO on the web aren’t quite as automatic as what we get with Windows hashes and tickets. After a brief diversion, I’m returning to my series on SharePoint with RMS. This post finishes off the baseline considerations, although there’s a lot more to say. But at last, in this post, we’ve reached the point where we know that RMS thinks I’m cool – so now what? Or if you prefer, I’m taking a look at the RMS Use License that is typically embedded in Microsoft Office documents, or in other cases might be associated with a client’s machine. The Use License that RMS issues acts like an offline enforcer of allowed rights. The rights granted by RMS and the duration they persist define what a user can do with their offline copy of RMS-protected content and how long they can continue to take those actions before they need to re-visit SharePoint and the RMS infrastructure in order to claim fresh rights. Since rights persistence is defined by the owner(s) of a SharePoint list, the impact of those settings should be well understood by any users that have this control.This post focuses on what a user can do offline once RMS has done its job, and the user’s experience once those rights expire, bringing the tension between valid offline access versus timely rights revocation to the fore. I’ve been working from home a bit more lately, and with that, I’ve been fine-tuning how I work. For instance, I’ve been using the “Use all my monitors” setting in order to stretch my remote desktop session across two screens. In Windows 8 this is a big improvement, as your monitors can be different resolutions and it supports that just as if you were at your desk. UPDATE 9 May 2012: This article has been out there for nearly 18 months but I’ve only just got a comment today that’s invalidated it. In short, everything here is accurate until you get to the point when you synchronise to your Windows Phone with Zune. At that point, Zune will transcode Lossless WMA files to MP3, even if the conversion settings are set to, “Only convert media files that aren’t supported by the device”. As described here, my device does support these files! Evidently, as James Shiers points out, the problem is not device support, but that the Zune software doesn’t support Lossless WMA (no citation unfortunately). What makes this even more confusing is that the quality settings are greyed out until you select the other option, so there’s no indication that this might be happening. In fact, the only real clue you have in the Zune client is that the file size will be smaller than the original. All of this is a bit embarrassing since it proves I couldn’t tell the difference from 320 kbps mp3, which was the whole point of the effort to begin with, but there you go… :/I’ll leave the post in place, in case the transcoding process is useful to anyone, and in case a new means of syncing supports these files in future. When I’m not wearing my SharePoint hat, I try to find the time to make electronic music. Over the last few years I’ve invested a great deal of time and effort moving from a PC-based Digital Audio Workstation (DAW) to an entirely outboard setup, with a large mixing console and various synths, drum machines, sequencers, samplers and dynamics processors. All of this suits me greatly, as it means I’m doing one less thing in front of the computer screen. I’ve recently been involved in a somewhat unusual client engagement, in that I was designing and delivering the infrastructure without knowing the shape of the IA or solution architecture. Obviously, this imposed some restrictions on what we could define, but it also meant that I had to handle some aspects of the engagement that would normally be taken care of by other colleagues. To that end, I suppose some of these considerations aren’t purely infrastructure-specific, but they could be in an engagement like this one and they’re things that infrastructure people should understand. Hopefully it’ll be useful for solutions people as well. Being the good SharePoint advocate that I am, I recently tried out the Office Web Apps in SkyDrive (Windows Live) for collaboration with my wife (primarily expenses spread sheets, etc). I’ve always found Google Docs to be lacking in many ways and I wanted to get more experience with the Office Web Apps since I typically use the full Office 2010 client at work. Despite a few annoyances, we were getting on reasonably well, especially since it’s free. I needed to crack a document open in the full version of Excel 2010 to format in anger once, but this is an acceptable compromise for a free, web-based document store. Fast-forward to the other day and my wife decided to use the Office Web Apps to draft a document rather than using Microsoft Works or Open Office (the other options on her home laptop). Despite some slow responses periodically, all seemed to work well, or so she thought until she got in to work the next day and opened up a blank document.